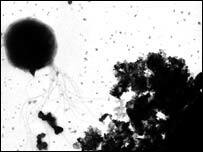 An organism has been discovered that can thrive at a record-breaking 121 Celsius. The single-celled microbe grows at higher temperatures than any other known lifeform, according to scientists in the United States. 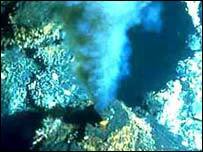 These hydothermal vents, warmed by molten rock deep within the Earth's crust, teem with strange lifeforms, such as tubeworms and huge clams. Even autoclaving - the process used to sterilise medical instruments - cannot destroy it. The fact that it can survive temperatures reached inside a pressure cooker has implications in the search for early life on Earth and other worlds. Strain 121 may be similar to the primitive organisms that existed on Earth some four billion years ago, when the planet was little more than a fiery ball of rock and metal bombarded by meteoroids. Other planets, like Mars, were also much hotter in their past, raising hopes that some kind of microbial life might have flourished there. Kazem Kashefi, one of a pair of microbiologists from the University of Massachusetts in Amherst who discovered strain 121, says nobody believed there would be an organism that could grow at that temperature. "This organism not only survives at 121 C, it can also reproduce," he told BBC News Online. "The good thing is it's not a pathogen," says Kashefi. "There are no known pathogens among the archae group." One concern, though, is whether some of these tough guys could survive a ride to another planet on a spacecraft. Karl Stetter, a professor of microbiology at Regensburg University in Germany, says the autoclave results "should be possibly considered in interplanetary missions in order to avoid contamination". He says strain 121 is very similar to an organism discovered by his group which held the previous temperature record for growth (113 C) and can also survive autoclaving. The latest research is published in the journal Science.